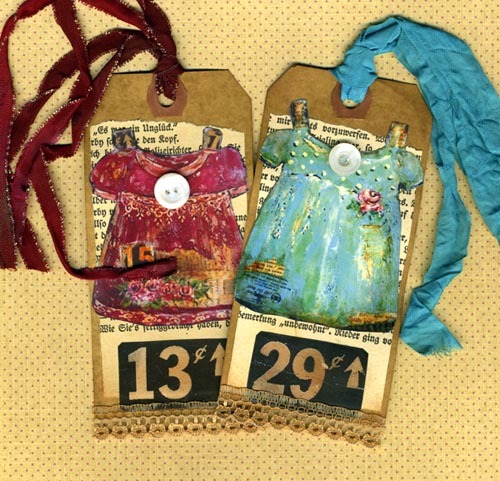 A couple of grungy tags using Joanna Pierotti's collage sheets. I'm having fun playing with these little dresses. Just added them, and another set to my Etsy. Those are totally adorable and charming tags. The dresses are so pretty to be left unnoticed. What a beautiful site you have. These little dress tags are adorable! Oh these tags are way too sweet,Rande they are fabulous. Ooooh, now these are awesome, Rande!!! WOW! Wow Rande just love these tags. Oooooh!!! Me loves the little dresses!!! Love 'em!! You are definitely doing great art with Joanna's collage sheets! You are having the best time with JoAnnA's collage sheets; and, you're making the coolest things!